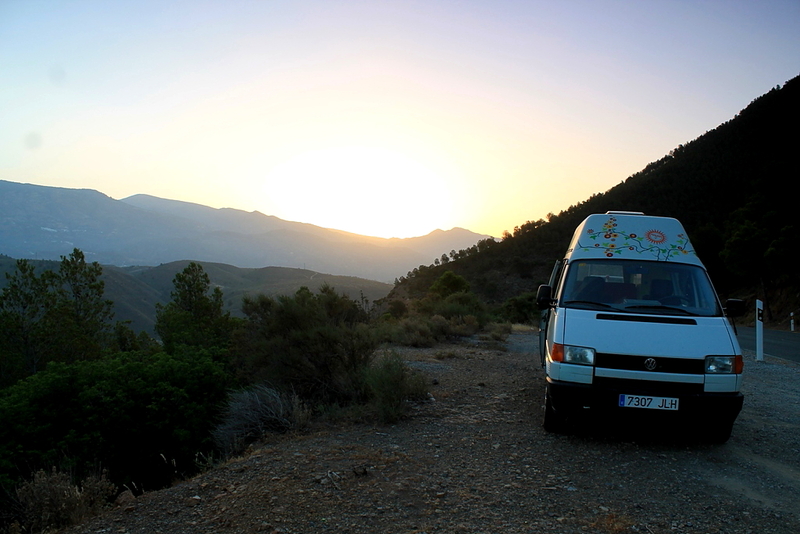 THE sun hasn’t yet risen above the eastern Alpujarras. 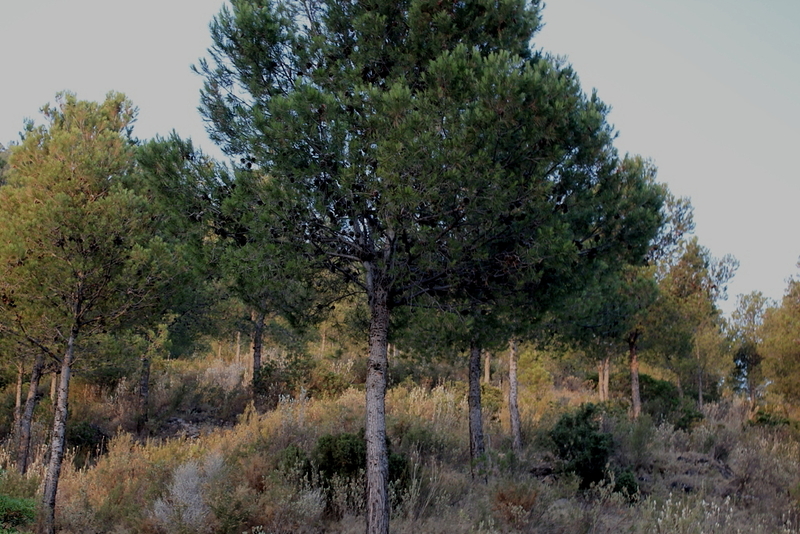 The air is cool and fresh on the slopes of Sierra de Lujar. I lock the van and clump off up a track that leads, eventually and hopefully, to a high and remote farmstead above the pine forests. 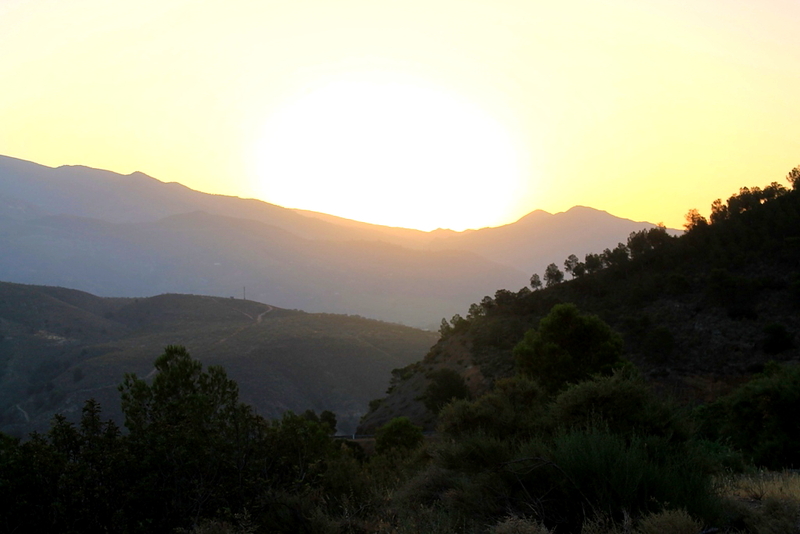 Behind me, the Sierra Nevada – the highest peaks in Spain – lift themselves from blue shadows into the dawn sky. They fill me with expectation. It’s going to be a memorable day . . .
Around the second bend in the track, and probably less than three-hundred metres from the main road to Orgiva, I enter a clearing full of shapes. These grey and black shapes are moving in the half-light; they are grunting and blowing; trampling the undergrowth. Wild boar. This should not be happening. Alarm and confusion. I have blundered from the real world into a land of horror fantasy. These primaeval beasts are the stuff of nightmares, aren’t they, not animals indigenous to a modern European country? And they are, to a trotter, every bit as terrifying as the boars depicted in fiction: great pyramidal spines; tufts of coarse spiky hair; powerful shoulders; stiff tails; unearthly noises. Still confused and alarmed, I merely stand there watching, though aware I have strayed into a dangerous and potentially fatal situation. The boars, their foraging interrupted, move briskly up the track and into the trees, how many I don’t know because I am too stunned to count – perhaps a minimum of twelve and a maximum of twenty, some medium-sized and the rest big. And big is big. Again I am alone. Peacefulness. What do I do now: proceed through the forest or return to my van? I have disturbed a herd of wild boar and they have retreated to darker places. They have given ground. Is that how it works? Do wild boar seek the shadows rather than confrontation? Thoughts racing. Last year a Guardia Civil officer was killed by a boar. Gored to death. That’s a policeman with a firearm and trained how to use it. I have a pair of telescopic trekking poles from the camping shop in Richmond and a French penknife. But my decision is made for me, because I become aware that a large dark shape has detached itself from the herd and is drifting purposefully through the undergrowth to my right. Rearguard action. It’s a shadow in the shadows and it halts behind a tree, perhaps twenty metres away. I can make out half a head and an ear protruding from the trunk. In other circumstances this might appear comical, like a child attempting to hide. But this is a wild boar protecting its herd, on its own turf, in its native environment – and it’s watching me. I retreat down the track a few paces and cast a backwards glance. I see the boar turn and vanish into the undergrowth. That’s the last I see of it – but not the last backwards glance I cast before regaining the main road. I toss my gear into the van. Still in a state of shock I wonder what to do next. A walk to the high farmstead is out. It’s still only 7.15am. But – and I know this isn’t particularly fashionable – I have a Plan B. FROM WIKIPEDIA: Actual attacks on humans are rare, but can be serious, resulting in multiple penetrating injuries to the lower part of the body. They generally occur during the boars’ rutting season from November–January, in agricultural areas bordering forests or on paths leading through forests. The animal typically attacks by charging and pointing its tusks towards the intended victim, with most injuries occurring on the thigh region. Once the initial attack is over, the boar steps back, takes position and attacks again if the victim is still moving, only ending once the victim is completely incapacitated. This entry was posted in Camping, Climbing, Environment, Footpaths, Hiking, Mountains, Walking, Wild boar, Wildlife and tagged Alpujarra, Alpujarras, outdoors, Sierra Nevada, Spain. Bookmark the permalink. I won’t forget it in a hurry, Hanna. I was looking over my shoulder the rest of the day. Today I’m still looking over my shoulder. All of a sudden the world is full of scary animals. Perhaps they are all out there watching us – waiting for the moment to pounce. Thanks for that, Hanna. There’s a thunderstorm here at the moment. We had our share of rain yesterday and the day before with ½ billion tons of water from a very wet summer low pressure. Hi cuz. Could’ve done with a tartan army behind me – or in front of me. Mind you, those red deer stags can be pretty intimidating in the wrong situation. I wouldn’t get too close in the rutting season but otherwise they’re OK. Still enjoying sunny España? Si senor. Still feels very strange, mind. Many years ago, a TV programme showed postmen being trained to deal with dangerous dogs. They were taught to look down and round their shoulders on the grounds that this posture sent a just-passing-through message. I experimented and found that the technique seems to relax a variety of domestic animals. It might work with wild boar. I saw one hundred metres of ground which had been ploughed by feral pigs near a hut in New Zealand. I didn’t wander around in the dark that evening after seeing how much power the pigs had at their disposal. You did well to stay calm. Hi John. Thanks for that. Sounds like some good, solid advice there. It’s good to know these things and then have a strategy in place for when the unexpected happens. I think what played in my favour was that I was so totally surprised that I just stood there in silence trying to take things in, rather than panic and make noises which might have sounded threatening. I shall be avoiding the forests at night and the early hours of the morning in future. Thanks for the tips. I’m assuming you didn’t get your fingers chewed off, unless you typed this post with your nose. Wild boar have been released into a wood near where I live. Haven’t heard of folk being eaten yet, but give it time. I’ve been hassled by sheep and that was bad enough. Don’t know how I’d cope with a gang of wild porkers. Chris, don’t walk in the woods after dark. There was a wild boar shot in Coleford town centre, in the Forest of Dean, less than two months ago because there is nothing for them to eat in the woods. It’s true. They are taking over the towns. Look here. Don’t think you’re safe in Lancashire. They want their country back. There’s a weird juxtaposition at the end of thatarticle to do with the madness of fights involving weapons. 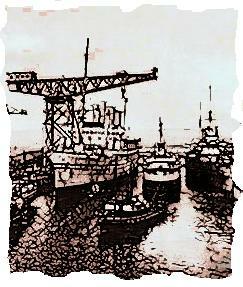 It evoked images of marauding boar with knuckledusters and flick knives! Interesting post, as ever, Alen. I visit a house in France a few times a year where wild boar regularly scrub up the farthest garden area in the night. I was sufficiently curious to bivi out one night to see what was going on – lots of deer wandering about and owls hooting. Maybe I was lucky no boars appeared although at the time I was disappointed. I have come across them in the forests of Europe and they tend to run away very quickly but apparently don’t come between a parent and her youngsters. In Corsica [GR20] I remember the campsites were guarded by electric fences. Hi John. I saw the lynx story on the ITV news. I was amused by the fact the zoo opened to the public on the grounds it was probably the safest place to be because the lynx had fled. I’m not so sure I would have bivvied in the garden out of curiosity. In fact, I wouldn’t have. We once camped on a site near Royan, in the Girond, and one evening I went for a run through the forest. On my return a chap warned me about the wild boar. I didn’t go again. I’m scared of bears as well, but there aren’t any down here, thank god. Talking of bears – out in Yosemite [yawn yawn] they were quite common. Whenever I came out of the tent early hours there would be one wandering around looking for food. We had bear boxes to store all our food and smelly things but the bears realised that when you were cooking the boxes could be open and they would wander in to try and steal food. Several very close encounters ensued, but I’m still here. Just don’t keep any food or toothpaste/soap in your tent! There were some legendary tales regarding bears. Thanks for that. I made the mistake of reading Bill Bryson’s A Walk in the Woods several years ago and that put me off bears for life. The chances of me camping wild in Yosemite were pretty remote before I read your comment, and now they are more remote than ever. My closest encounter with a dangerous animal took place early one morning on the isle of Harris when my tent got trampled by a cow. That was pretty frightening. Made me think of our bear encounters in the States, too. Including a grizzly sleeping about 100 yards from our tent one night in Alaska… You need nail clippers, like in Bill Bryson’s book. Blimey, more bear encounters. I’ve obviously led a sheltered life. If I remember correctly, Bryson had a gun as well! I once had a wild boar run across the road in front of my car in Andalucia. There are plenty of them here! Happy hiking! I think you’re a good bit to the west of me so there are obviously plenty of them about. I just hope they are getting plenty of stuff to eat and don’t develop a taste for hikers. Or runners! Would NOT fancy that. There was a reason why all those wolves and bears and things were hunted down, back along in Merrie England. I’ve found cattle quite scary enough, on occasion. Hello Mrs P. I’m inclined to agree with you there. I’ve always viewed those people who want to reintroduce wolves to the Scottish Highlands as more than a little unhinged. Cattle, and especially those frisky bullocks that refuse to leave you alone, are the limit so far as I’m concerned. Bloody scary! A friend of mine actually bumped into wild boar in Scotland on the Corrieairack Pass – he was alone and pretty worried but luckily they ignored him. And I’m totally against the ‘re-introduction’ of all these dangerous wild species in Scotland too – especially as I almost always walk alone. Blimey, I’ve been in that area, up near the Corrieairack Pass. I didn’t know there was wild boar there. You just can’t get away from them these days. If the first series of Game of Thrones was anything to go by wild boar are the sole reason for another five series being inflicted upon the world. Dangerous things indeed. Amazing experience, but can imagine the mix of excitement and terror was sending conflicting messages. Hi Paul. I must be one of the few people in the world who has never seen an episode of Game of Thrones – at some point in time I will acquire a box set. But I watched The Hobbit the other night, and there were some beasts that looked a cross between wolves and boars, and I felt quite uncomfortable. What a scary encounter, not sure what I would do if I encounter one! Rumour has it they are supposedly quite aggressive and I am sure a human can’t outrun there guys. Hi Inger. Apparently, they are very aggressive, especially when they have young. And I don’t know about you, but I certainly couldn’t outrun one.